The SNK NeoGeo always had "mythical" status during my childhood... everyone knew what one was, but it was so out of the price-range of what we could hope to get it was never really on our radar. The NeoGeo was a simple concept, using the exact same hardware as an arcade, with just some technical tweaks to make it more suited for home users... (and unfortunately the same cost!)... 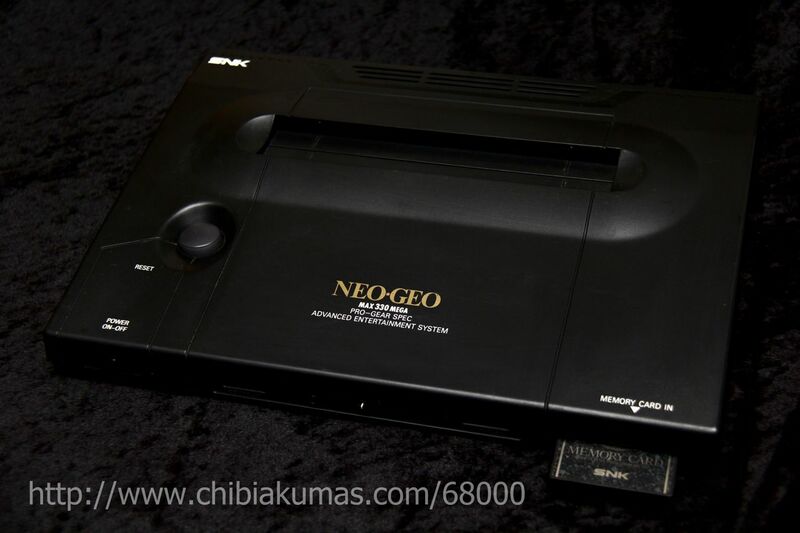 the Neo Geo gave the wealthy the ability to have all the power of high-end arcade hardware at home..
Now that the NeoGeo is easily emulatable, we can all run - and develop for - this hardware at home! but don't worry, we'll learn about sprites later! BIOS_CARD_MODE $10FDC5 (byte) "command error job mode"
BIOS_MESS_STACK $10FEC6 (long) 5 longs; first is the pointer to the data. SYSTEM_HOW_TO_PLAY $C00474 display old-style how to play. uncomment if you want to use it. 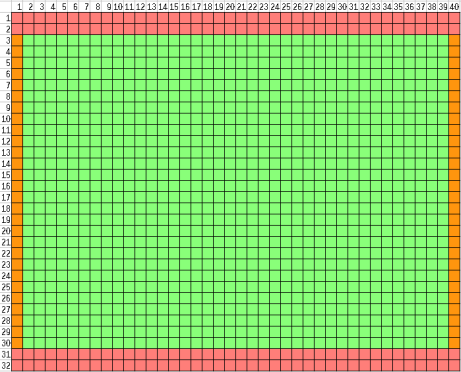 Each color is 2 bytes in size, there are 16 colors in each palette, and 256 palettes. The first color in the first palette is special ($400000), it must be $8000... this is called the "Reference color"
The Color format is quite odd! There is also a "Dark" bit... which is effectively the least significant bit for all 3 color channels. Get the YM2610 PDF for all the info! 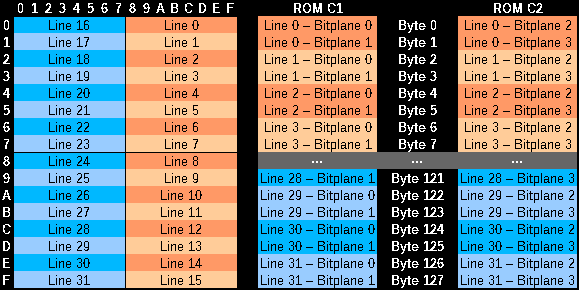 The Z80 has its own program code contained in a ROM and separate memory - and we have to pass data betrween the Z80 and 68000 with a single byte RW port! 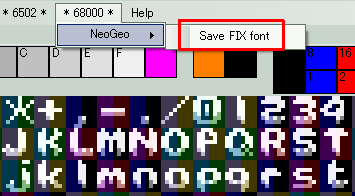 On the NeoGeo Sprites are 16 pixels wide, and are made up of tiles 16 pixels tall... they are 16 colors (4 bitplanes) so each tile is 128 bytes... The NeoGeo is capable of up to 380 sprites. 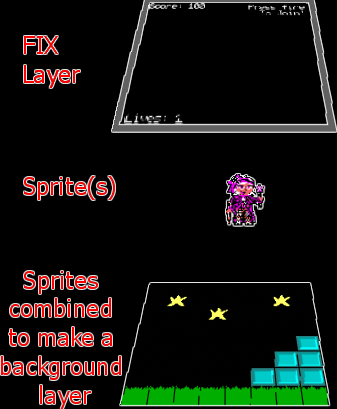 A sprite can be made up of up to 32 tiles to make the sprite taller... there is also a 'Chain' bit - this will connect a sprite to the previous sprite (Sharing its position) to make a sprite wider! 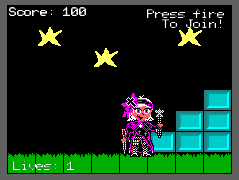 Each sprite is defined by 1-32 tile definitions, A palette/flip byte, a Scale byte, a Ypos/Height byte and an Xpos... lets see what all these bits do in detail! 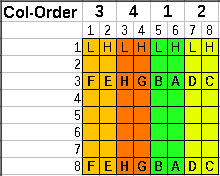 Neo Geo programming for the absolute beginner - My template Header/footer are based on this!